Update from Jolynn Paige of Paige Pro Communications! Over 300 people attended the 15th anniversary gala celebration of the Leelanau Children’s Choir and Youth Ensemble, under the stellar direction of Margaret Bell. Approximately 70 students, some returning alumnae, performed at Northport Community Arts center last Friday evening (June 20th). The audience was thoroughly entertained by several of costume changes and crowd pleasing favorites from current broadway musical hits ranging from Les Miserables to Wicked. Guest singer Guy Molnar brought his professional stage talent to the spotlight as he sang “All Good Gifts” from Godspell and “Mr. Cellophane” from Chicago. Smiles and hugs abounded, and a fabulous, classy catered event (Silvertree) following the concert brought people together under a candle-lit canopy. Guests were serenaded by a string trio and munched on local strawberries covered in chocolate and other Leelanau County local delicacies. The board of the LCC/LYE gave out three generous scholarships to graduating seniors Hans Dalton, Sophia Mosher, and Juliana Lisuk. This tradition will now be continued in future years. (pic 1) Sophia Mosher, Juliana Lisuk, and Hans Dalton, all graduating seniors, received generous scholarships from the board of the LCC/LYE. (pic 2) Juliana Lisuk receives a hug and a scholarship from director Margaret Bell. 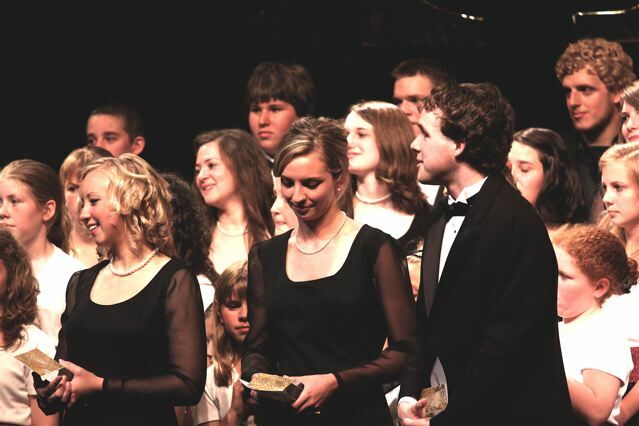 The Leelanau Children’s Choir and Leelanau Youth Ensemble celebrate 15 years of music under the direction of Ms. Margaret Bell with a special concert this Friday (Jun 20) at 7:30 PM at the Northport Community Arts Center. The concert will feature current and returning members of the choirs and special guest artist, Guy William Molnar. An afterglow reception to celebrate this milestone will follow the concert. Tickets are $20.00 for adults and $5.00 for students 18 years and under. You can call 231.883.SING or visit the Leelanau Children’s Choir and Youth Ensemble web site for more information. An update with photos from the concert!